(Phys.org)—Researchers have shown that tomato pulp dissolved in water can eventually be turned into a powder of nanoparticles containing carbon dots with diameters of less than 5 nm. Like all carbon dots, one of the main characteristics of the tomato-sourced carbon dots is an intense fluorescence, which may lead to applications in imaging and sensing. 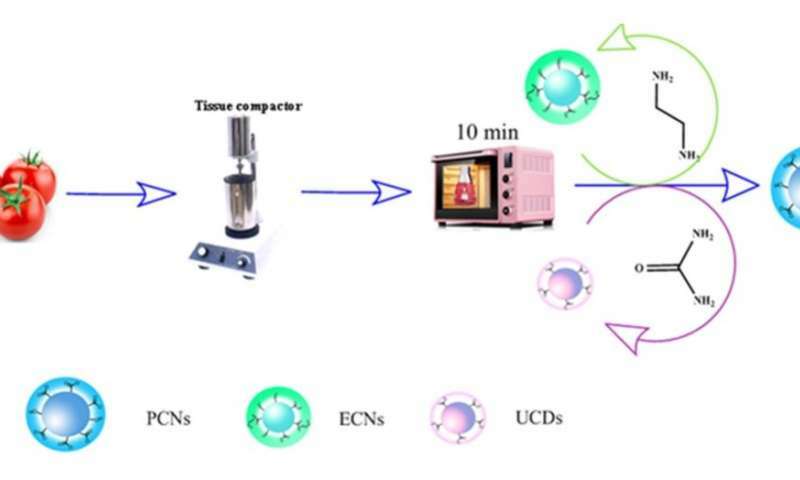 The researchers, led by Jinping Wang at Qingdao Agricultural University, have published a paper on the synthesis of carbon dots from tomato in a recent issue of Nanotechnology. Carbon dots are a new class of fluorescence nanomaterial that researchers are investigating as a possible alternative to semiconductor quantum dots and organic dyes. Because they are so new, the quantum mechanisms underlying their fluorescence are still not well understood. Carbon dots can come from many different sources, from carbon nanotubes to various kinds of biomass, such as fruits, vegetables, and flowers, and dots from different sources exhibit different fluorescence properties. An advantage of using tomatoes as the source of carbon dots is that tomatoes are inexpensive and the process is relatively simple. Basically, fresh tomato is chopped into pieces, crushed to a pulp by a tissue compactor, dissolved in water, heated in a microwave, centrifuged to remove any large particles, and then filtered by dialysis, leaving behind a solid powder of nanoparticles. Although the process is simple, the researchers showed that it still has the potential to produce high-quality carbon dots. One of the most important results of the new study is the UV fluorescence properties of the carbon dots can be controlled due to the quantum confinement effect, which is not often the case with carbon dots sourced from biomass. Here, the researchers demonstrated that, by adding certain organic compounds (ethylenediamine (EDA) and urea), they could control the size and tune the fluorescence of the nanoparticles formed from the tomato pulp. "Fresh tomato-sourced carbon dots tuned by urea can emit fluorescence in the UV region due to the quantum confinement effect," Wang told Phys.org. "Our future research plan is to obtain red emissive carbon dots using biomass as precursors." To illustrate the potential applications, the researchers evaluated the carbon dots for their use as staining agents for bioimaging fungi, and also as sensors for vanillin, which has applications in the biofuel industry. The researchers demonstrated that the carbon dots were highly biocompatible with the fungi and became brightly illuminated when excited by a laser. In the case of vanillin sensing, they showed that the vanillin quenches the fluorescence of the carbon dots, with the amount of quenching being proportional to the vanillin concentration. The researchers plan to further investigate these applications and others in the future.